If you are considering buying a new horse, we strongly recommend a complete Pre Purchase Examination by a veterinary surgeon to assess the horse’s soundness and suitability for your specific requirements. It is a source of some pride to our profession that the word ‘vetting’ has entered the English language to denote a very thorough examination and check for defects to a certified, trusted standard. The word ‘doctored’ seems to have a less favourable professional association! 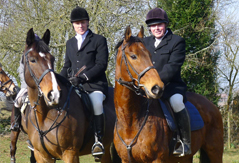 Our vets always endeavour to discuss the horse, any particular areas of concern and its intended use with the prospective purchaser prior to the Pre Purchase Examination. 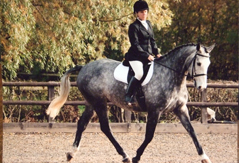 The format of the Examination is prescribed by the British Equine Veterinary Association and the Royal College of Veterinary Surgeons and their Guidance Notes on the Examination of a Horse on behalf of a Prospective Purchaser are set out in detail below; a copy of these Guidance Notes is given to all our clients before the Pre Purchase Examination. The standard examination is conducted in five stages, although the exact sequence may vary. The horse is then walked and trotted on level hard ground in order to detect any abnormalities of gait and action. Flexion tests may be performed at this stage to determine if the flexion of limb joints reveals any lameness or limitation of movement and, if practicable and safe, the vet may ask to see the horse trotted in a circle on a hard surface. Allow assessment of the horse when it has an increased breathing effort and an increased heart rate. This may enable the veterinary surgeon to detect unusual breathing sounds or abnormalities of the heart. Allow assessment of the horse’s gait at walk, trot, canter and, if appropriate, gallop. This may tire the animal so that strains or injuries may be revealed by stiffness or lameness after a period of rest. If ridden exercise is not possible for any reason then this stage may be conducted by exercising the horse on a lunge, but this fact should be made clear to the purchaser and on the certificate. A blood sample may be taken for storage (usually for six months) for possible future laboratory analysis to detect substances that might have masked any factors affecting the horse’s suitability for purchase. This is not a mandatory element of the Pre Purchase Examination, but we strongly recommend it for peace of mind. If a blood sample is not taken, then the reason is noted on the Vetting Certificate. The taking and storage of the blood sample constitutes an additional cost to that of the Examination and any future laboratory analysis is at the expense of the purchaser. On occasions and dependent upon his/her findings during the Pre Purchase Examination, the examining veterinary surgeon may recommend further diagnostic procedures are performed before an opinion can be reached regarding potential purchase. Examples of such procedures might include blood testing, radiography, endoscopy or ultrasonography. We will always discuss the clinical rationale for and costs of such procedure(s) before embarking on further investigation. After completing the examination, the veterinary surgeon will report his/her findings to the prospective purchaser and will come to an opinion, on the balance of probabilities, as to whether these findings do or do not prejudice the horse’s suitability for purchase for the intended purpose. These findings and opinion are recorded in a ‘Certificate of Veterinary Examination of a Horse on behalf of a Prospective Purchaser’, along with a diagram and written description of the horse or, alternatively, a record of its microchip and passport numbers. This Certificate is usually a mandatory requirement if the horse is to be insured and an Insurance Underwriter may modify the terms of any Insurance policy in light of the veterinary surgeon’s findings. Five Stage or Two Stage Vetting? Purchasers may request that the Pre Purchase Examination is limited to stages 1 and 2 above. We ask that all clients requesting a limited Two Stage Vetting complete a Disclaimer before the Examination stating that they are aware of its limitations. Essentially, stages 3 to 5 may reveal significant additional clinical information that would not be apparent without exercising, resting, then re-examining the horse. Examples of such information might include findings relating to lameness, the horse’s behaviour or the function of its cardiovascular or respiratory systems. If a purchaser requests a Limited Two Stage as opposed to a Full Five Stage Vetting, the limited examination may not reveal certain conditions which may have been discovered during the course of a Full Five Stage Vetting. The examining veterinary surgeon may then not be able to obtain this additional information and may not be able to advise as fully as to the suitability of the horse for purchase. 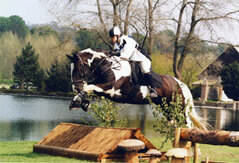 Tack/rider and area suitable for ridden exercise or lunge rein/whip and lunger for stage 3. If you are considering having a horse vetted or would like further information in addition to this summary, please do not hesitate to contact our Farm and Equine Department on 01568 612266.